If you’re an avid follower of TED, you may well have encountered Haas before. Way back in 2011, Haas took to the stage to demonstrate his vision for the future of wireless communications, using little more than LED bulbs. The talk also gave birth to the term ‘Li-Fi’, which is now the commonly used nomenclature for bi-directional, networked wireless communications using visible light, as opposed to traditional radio frequencies. Light modulation certainly isn’t a new concept, but Haas is looking to move things forward and enable connectivity through simple LED bulbs. 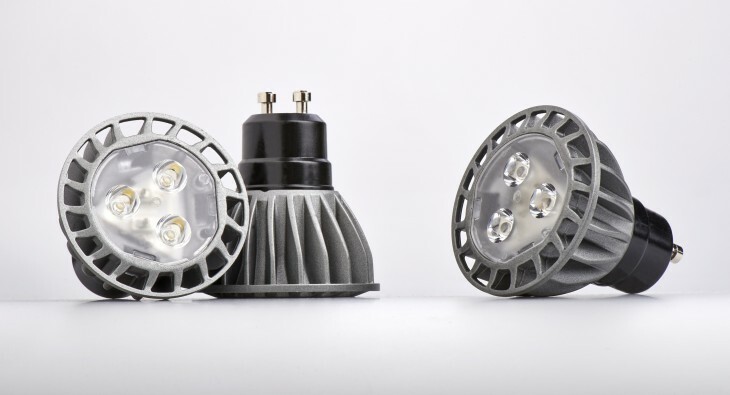 With Li-Fi, you can connect to the internet simply by being within range of an LED beam, or you could conceivably transmit data using your car headlights. The ramifications of this are huge, especially with the internet of things in full swing and the much mooted spectrum crunch expected to bite increasingly hard in the coming years. The Next Web caught up with Haas in his Edinburgh office to get the lowdown on where things are at, and where things could be heading with Li-Fi in the not-too-distant future. Founded back in 2012, Haas’s PureLiFi (previously PureVLC) is a spin-off from the University of Edinburgh, though much of their visible light communication (VLC) research dates back to 2008 when its delightfully titled D-Light project kicked off. Though the chunk of its efforts thus far have been confined to the research and prototyping realm, there are real, physical products out in the wild – it sold its first Li-Fi device to a US healthcare provider last year. And earlier this year, PureLiFi launched its first product proper – the Li-1st, which it touts as the first publicly-available bi-directional visible light communication device. Now, the Li-1st isn’t something you can buy off-the-shelf at Amazon. But it’s “on the market” with some of its lead partners, including companies from the security-focused fraternity. And this is one of the key selling points of Li-Fi over Wi-Fi – it’s harder for third-party prying eyes to infiltrate. Li-Fi signals are confined to narrowly-focused ‘beams’ that don’t travel through walls. Moreover, LED lights are natural beam-formers, which makes it easier to create separate uplink and downlink channels, which essentially means more secure internet browsing, given that both channels have to be ‘intercepted’ if someone did manage to coerce their way into the same room as you. “This [Li-Fi] is a technology that can aid cybersecurity in a very new way,” says Haas. The Li-1st allows you to network via a desktop photosensitive unit that works in tandem with an off-the-shelf, unmodified light fixture. The desktop unit has infrared LEDs to communicate in the uplink channel. We were given a demo by Haas in his light emporium at the University of Edinburgh, and the YouTube video we watched streamed flawlessly. The Li-1st delivers a capacity of 5Mbps in the uplink and downlink channels, covering a range of “up to” three meters. And yes, you benefit from a nicely lit working space too. It’s worth noting here that it has been shown that speeds of up to 10Gbps has been proven with Li-Fi too. While Li-Fi could become a more common fixture in security-conscious locations in the future (e.g. banks or government buildings), there are innumerable potential use-cases. Content can be tailored to specific locations through ‘fencing’, so that you know exactly what people and places are receiving what kind of data – even within a single room. Someone could even wander through various beams and receive information relevant to where they currently stand. So this is a potential scenario: Lots of spotlights in a room, with people wandering along with their tablet, passing through various beams, and the connection remaining constant throughout. And it’s this exact thing that PureLiFi is working on next – the Li-Flame will create the equivalent of a wireless network by turning LED bulbs into wireless access points, effectively letting you move between light sources without losing your connection. The Li-Flame will also feature a mobile unit that you can attach to your portable device, thus making it compatible with LED connectivity. Curiously, Haas tells us that PureLiFi has been testing with a “major aircraft manufacturer,” which hints at what could be to come for the future of air transport. You know that reading light above your head on a plane? That could easily be used to stream data to individuals at their seats, directly to their iPads or laptops. But delivering entertainment to your seat is only one reason why this could prove useful for airlines and aircraft manufacturers. So rather than having a rigid seating structure, different planes on different routes at different times could be reconfigured accordingly. Modularization is the name of the game here, with no pesky cabling to interfere with the shifting of seats. And given that cables often use a lot of copper, which is heavy, beaming data using the existing LED light fixtures is one way of remedying this. So..is this actually ever going to replace Wi-Fi? But the very fact that solid, opaque objects can interfere with network connections will be an issue in many contexts. It seems clear that if Li-Fi is to really take off via the mechanisms envisaged by Haas, it will likely be in a complementary capacity – initially, at least. With that spectrum crunch looming, reselling old analogue TV spectrum is proving to be one solution to increasing capacity. But that may not be sufficient with the so-called internet of things bringing ubiquitous connectivity to everything. Want to connect your kettle to the internet? Many already have LED lights on them, so this could be an easy way of hooking it up to the Web, and you could control it from your iPhone, be it to monitor power consumption or whatever. Intelligent car-to-car communications could be enabled via the vehicles’ LED headlights, with a view towards preventing accidents. Heck, you could even tether an LED earring to your body, and hook it up to sensors for tracking temperature, sugar levels and other vital health data. Elsewhere, Li-Fi could help with underwater networking, with divers and submersibles able to gain connectivity via LED. But why LEDs specifically? Why not other lights? Well, it all comes down to speed. Traditional incandescent light bulbs are too slow. The best at the moment is LED, though this may change in the future. All PureLiFi is doing is tapping a form of light transmission that is already readily available and widely accessible, which makes their barriers to entry far more surmountable. But there are still barriers. This ‘reservation’, of course, stems from an industry that may not be too quick to embrace something ‘new’ when it’s already heavily invested in the old world order. But how exactly does it all work, and how does everything all connect? Can you just use existing light fittings in your home? While it is possible to retrofit your existing set-up using powerline communications, the general idea moving forward is that companies and manufacturers will start building their equipment with Li-Fi firmly in mind. Redwood Systems, acquired by CommScope last year, is working on networked LED systems that not only transfers data over ethernet cables, but power too. In the future, some light fixtures will only have one connector, which works via technology known as power over ethernet. For example, while an ethernet cable may provide 60 watt of power, a typical LED light fixture only requires around 5 watt, so with one cable you could power 12 lights. So in new electrical installations, you could lay a CAT 5 cable to a light fixture, rather than a power cable. The data exists immediately at the light fixture. In September last year, EDF and OLEDCOMM partnered with Thorn Lighting to present prototypes of street-lights equipped with Li-Fi, during the Chalon en Champagne trade fair. Li-Fi is a burgeoning industry for sure, but developments are starting to ramp up somewhat. It’s estimated that the Li-Fi market will be worth more than $6 billion by 2018, according to analysis by MarketsandMarkets. Haas is well aware of the need for many more players in the space for it to be viable, and he’s hoping Scotland will be central to this drive. For now, PureLiFi’s funding comes mainly via research projects, but it’s looking to garner funds from the public purse, as well as ‘strategic funding’ via a number of big players from across the US and Asia. This is all about trying to “pull them into the center and convince them of the opportunity they have in terms of early participation,” says Haas. Haas is pushing to raise a signifcant sum of money to help build new premises for a Li-Fi center, while creating new jobs and developing all the underlying technology and business models for this fledgling industry. “The university has bought into that, the principlal has bought into it, and at the moment we’re looking for stragetic partners internationally,” says Haas. It’s very much in PureLiFi’s interests to encourage an ecosystem around this light-based technology, as it will be relying on manufacturers and a myraid of third-parties to be on board with this. “What we’re envisaging now is illumination, but it (light) will be a service in the future,” says Haas. Incadescent bulbs have a lifespan of around 2,000 hours, while LED have as much as 50,000 hours. “People who manufacture them (LED bulbs) are aware that their lifecycles are much larger, so they need to find new ways of adding service to the light they sell. That is one of these additional services that would enable Phillips and others to distinguish themselves from the competitors,” he continues. For now, Li-Fi will remain a thing of the future for most people.